Astrology is an ancient science of predicting the future. It tells us about things that will happen in our life much before they exactly happen. This helps us to prepare for a misfortune and helps us to become surer about the future. There is no exact theory that can be used to support what astrology claims. Some say this is not true. Whereas some believe that there is definitely something in this study. The study closely associates itself with stones and gems. These are worn as pendants and rings. Gold, silver or panch dhatu is used to make this jewellery as recommended by the astrologers. The belief is that when you wear a stone the reflection of it should touch your body. When the reflection falls on the body it creates an energy level that works on our future and destiny. Well one accepted fact is that a gem can reduce the impact of an incident. It cannot remove the incident completely. Suppose you were to meet with a fatal accident it can ensure that you survive after the accident it cannot remove the accident all together. To explain the connection of gems with astrology we are going to discuss about ruby and astrology in this article. 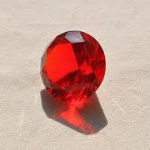 Ruby as we all have seen it is a red coloured stone. IT is found in many shades of red and maroon. Well Ruby is a stone that is found in many colours apart from red but in astrology red ruby is the one that is used. In terms of hardness it is only next to diamond and nothing else. Ruby is a strong stone. It is said that the best of rubies can shine in the darkest of rooms. If dipped in milk about hundred times it can turn the milk red. When we say red the only element in nature that comes to our mind is the sun. No wonder Ruby is associated with the sun. It is called manik in Hindi. Some believe wearing ruby can bring a son in the family. It represents love. In the western astrology as per sun signs it can be worn by a Pisces, Virgo and Capricorn. In Hindu astrology it is recommended as per the natal chart of the wearer. As said it is worn for the planet sun. It is worn by people who don’t have a strong sun. It can also be worn by those whose sun is placed awkwardly. Sun is associated with career and success. As per astrology, people with a strong sun rise very high in life and quite fast. There is a line on our palm that is called the sun line. It too indicates success and professional life. When you wear a ruby ensure that you buy it from a reliable source otherwise you might be cheated. Try to take it from the astrologer who has recommended it to you. They will know what size, weight and class of Ruby you should wear. Never wear a ruby that is cracked. The stone is sensitive. It changes colour with situations. When the colour of the ruby fades that means the wearer will soon meet with a disaster. The colour can also deepen at times. A bloody red ruby may mean that the wearer will be in trouble soon. The colour of the stone can become pale white when it comes in contact with something that is poisonous. It can immensely change your personality. Make you more dynamic. It provides a lot of positive energy to the wearer making them more confident. Gold or copper is used to make a pendent or ring for this stone. It can be worn on a Sunday. You can wear it in the ring finger only. Om japa kusuma samkasam, kasaya peyam maham dvitim, tamoran sarva papagnam, pranato smi divakaram is the mantra that you need to chant when you wear this ring. On every Sunday you can recite this one hundred and eight times so that your wish is fulfilled and the stone never loses the charm and strength. When you wear a ruby you should ensure that you don’t wear diamond, blue sapphire and cat’s eye with it at the same time. These planets don’t get along well so can cause trouble to the wearer. Navratna is an exception in this case all the nine gems representing the nine planets is worn at the same time. Sun is considered to be the first planet in Hindu astrology as a result it is associated with number one. Ruby can be worn for various health and personal reasons. It is worn for lung disease, back bone related issues, and diabetes and hypertension can be handled by wearing a ruby. Apart from health concerns it can also prove very useful in success and career. It can be worn by businessman, actors, scientists, etc. It can remove hurdles that come on your way to success as a result it can take the wearer to new levels of achievement. The stone can eradicate poverty too. The price of ruby depending on quality, size and cut can range from a mere two thousand rupees to twenty thousand rupees. Well do consult your astrologer and the stone he recommends buy accordingly. Please don’t worry about the price that you are spending, if you spend a twenty thousand on it you can get back as much as twenty lakhs from it. I am not exaggerating this is the truth. Many people from across the world have worn this and have benefited from it too. There is a very interesting aspect here. Once a woman was told that she should wear Ruby. She got very excited and thought that instead of a single stone why not wear a necklace make of Ruby. She was under the impression that doing this would improve her luck ten folds. This is not true at all. Astrology says that you should wear a single stone. Wearing a cluster of rubies in a necklace can never help. The astrological benefit can be obtained only when a single stone is worn. This is all that you need to know about the ruby. I hope you have understood the connection between ruby and astrology. The stone is representative of the sun. Sun is the focal point of the solar system. Without it there would be no life. It is also called the kalpurush. This makes it possess extraordinary powers that can change your life forever. Do consult an astrologer and keep all the points that we have mentioned in mind before you buy this stone and wear it.